49 years ago on this date (a Thursday in 1967), "Tomorrow Is Yesterday" premiered on NBC. What did the critic say? And how many of us were watching? So how did “Tomorrow Is Yesterday” do when tomorrow truly was yesterday … in 1967? Star Trek has a cleverly worked-out episode tonight with several touches of humor. The USS Enterprise gets caught in a time-space warp or whatever it is that they always make up on these shows, which is the excuse used by the writers to place a UFO in the 1960s, which, indeed, is now our spaceship, the Enterprise. A jet spots the space craft hovering over the Earth, gives chase, and the pilot ends up aboard the starship but he poses a terrible problem. He now knows too much about the future to be allowed to return to the past. Also, the photographed tapes of his mission must be retrieved from Earth. It’s an interesting problem and an interesting solution. Imaginative and engaging space-age nonsense tonight that puts the starship Enterprise into a wholly untenable position. Jolted out of its time sphere by an accidental brush with a star, the spaceship finds itself planted smack into the year 1960, interfering with an approaching jet plane from Earth and taking the jet pilot prisoner. How Captain Kirk and his crew get out of this mess takes some tall doing, but script writer D.C. Fontana rides it all out with a smile. A.C. Nielsen Media Research declared “Tomorrow Is Yesterday” a winner, too. “Tomorrow Is Yesterday” started in second place, and then claimed the No. 1 spot at 9 p.m., above the movie on CBS -- the television premiere of 1964's Behold a Pale Horse, starring Gregory Peck, Anthony Quinn, and Omar Sharif, which trotted in for CBS in last place. In honor of its broadcast anniversary, watch the original episode (try amazon.com, Netflix or Hulu Plus). 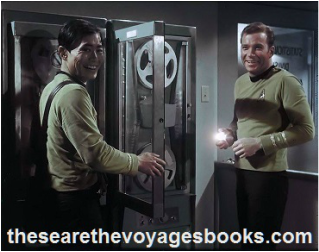 These are the Voyages TOS Season One.